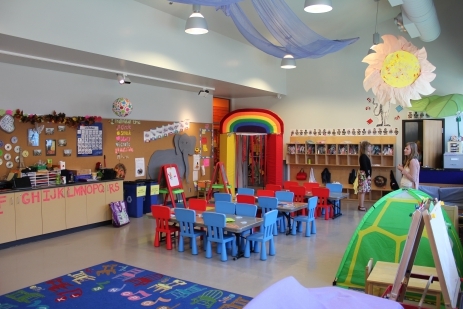 ArtsCalibre Academy’s Preschool is located within the brand new Arts Centre wing of the Cedar Hill Recreation Centre, at 3220 Cedar Hill Road in beautiful Victoria (Saanich), BC, Canada. Completed in August 2011, Cedar Hill’s Arts Centre includes dance, visual arts and ceramics studios, exhibition areas, a multi-purpose room, our Preschool, and more. This addition enhances an already excellent facility which features a large fitness studio, indoor tennis and squash courts, meeting rooms, Seniors Centre, art gallery, auditorium and a café. Ample parking with effortless drop off and pick up. We believe that Cedar Hill’s facilities are an extraordinary match to our philosophy and vision for ArtsCalibre, and it offers enormous benefits for our children and families. Arts and Recreation Centre amenities are available to our children as an integral part of our curriculum. These same facilities are also available to families on either a drop-in basis or through scheduled programs offered in Saanich Recreation’s Active Living Guide. Elementary Campus – Gordon Head, 4201 Tyndall Ave.
ArtsCalibre Academy is currently located in the former Gordon Head United Church, located at 4201 Tyndall Ave. in Gordon Head. Programming at our Gordon Head campus includes Junior Kindergarten through to our expanding Middle School programs (K to Grade 9 and beyond). The campus is also located within immediate walking distance of Lambrick Park sports fields and the Gordon Head Recreation Centre where students attend their swimming lessons an utilize the sports fields. As an added benefit to our burgeoning Outdoor Education programming, the campus’ proximity to the Mt. Douglas/Pkols ecosystem will be prove to be invaluable in the development of our lesson planning; we can’t wait to experience these new discoveries with our students. Student favourites, like the Mystic Vale, are still relatively close and will remain in our repertoire for the foreseeable future. The Gordon Head campus is served by local collector roads, BC Transit (28 Majestic/Downtown) and Saanich’s cycling network. Additionally, there is abundant and free, on-site parking in the school’s paved lot. A good reference point for those unfamiliar with this area is Lambrick Park.